To enable No. 21C123 Blackmoor Vale to be overhauled and returned to traffic it requires a new inner firebox costing £199,900. 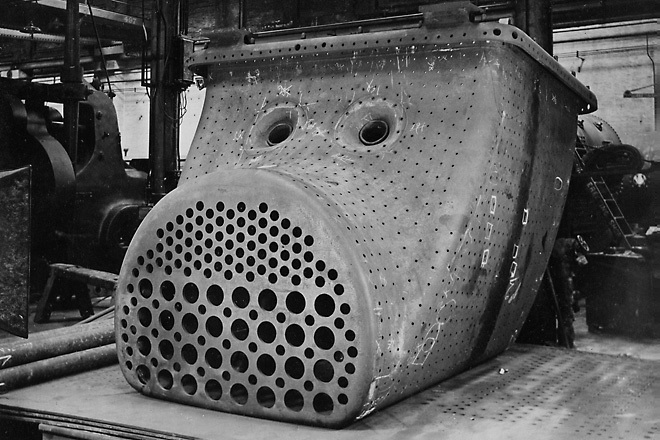 To return the locomotive to traffic will require a new inner firebox and with this in mind we have purchased the major items necessary to fabricate a new inner firebox for No. 21C123. Currently, two new thermic syphons, costing £15,000, the foundation channel sections, costing £7,110, (necessary to construct a new foundation ring to connect the outer and inner firebox wrappers) , the firebox tubeplate £8,720 and the firedoor inner backhead, £17,000 have been purchased. The total cost of fabricating the new inner firebox utilising the items already purchased, removing the old firebox from the boiler. fitting the new inner firebox to the outer wrapper and fitting all the water space stays and undertaking the necessary hydraulic and steam tests is £199,900. Although The Bulleid Society is not a registered charity, but both it and donors can take advantage of the taxation benefits of charities if donors make their donations to The Bluebell Railway Trust, a charity whose objects include support for the preservation of railway equipment, especially connected with the Bluebell Railway. Where advantage is taken of H M Revenue & Customs’ Gift Aid scheme the value of donations to the Trust is increased by 25% and, where donors pay income tax at higher rates, they can get tax relief on their donations. Money donated to the Trust and the related Gift Aid will be held in a restricted fund that can only be used for the preservation and overhaul of Blackmoor Vale.